1960s: Students sit at desks in classroom, teacher hands papers to students. Girl sits at desk, opens paper, smiles, look across aisle, frowns. 4k00:264k / Ultra HD version A large and enthusiastic group assemble in front of the camera. One volunteer holds up a sign with "Thank You" written on it and others smile, give the thumbs up. In slow motion. sd01:551960s: The library has a wide variety of resources and learning materials, such as audiovisual material and newspaper records. 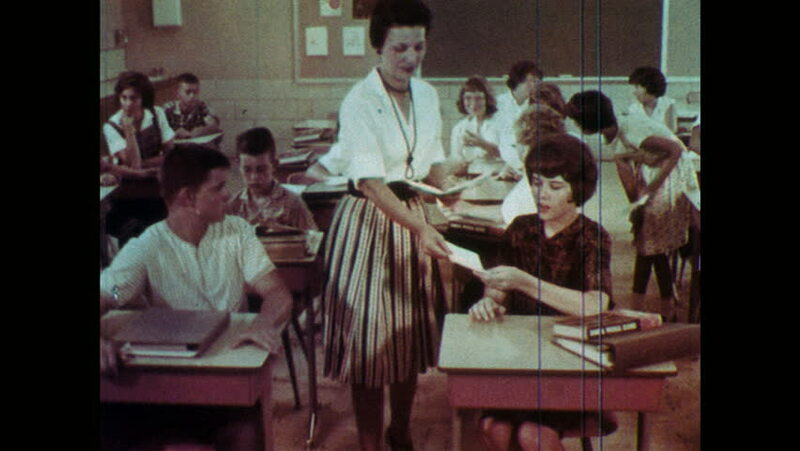 hd00:18UNITED STATES 1960s: Students Sit Around Table with Teacher in Classroom, Looking at Objects. hd00:181970s: Classroom, students talk, teacher addresses class, boy at front of room pets dog, boy in back raises hand, asks question. Kitchen, man at table with can of soup and egg. 4k00:304k / Ultra HD version A large and enthusiastic group of charity volunteers of mixed ages and ethnicity assemble in front of the camera with their arms around each other and big smiles. In slow motion. 4k00:311950s: man in hat sits on stool at lunch counter and talks to man in baseball cap in restaurant. men in suits sit around a desk, read paperwork, pack up, stand and exit office door.